For 2018, the Fall Fish Festival will be on Saturday and Sunday, October 6 and 7. Hours are 10 a.m. to 4 p.m. both days. For more information, call (530) 543-2674. 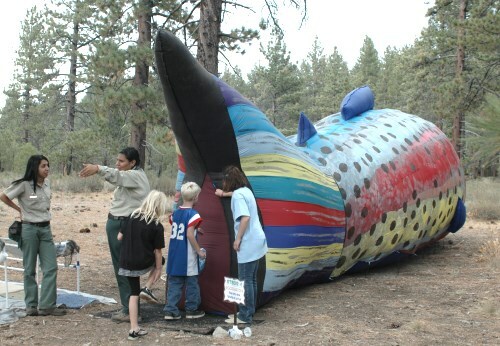 The Fall Fish Festival* is an annual event celebrating a variety of fish species that live in Lake Tahoe and surrounding streams. It is held every October at Taylor Creek Visitor Center on the south end of Lake Tahoe. The big draw at the Fall Fish Festival are the Kokanee salmon. These fish turn bright red as they make their spawning run up Taylor Creek. 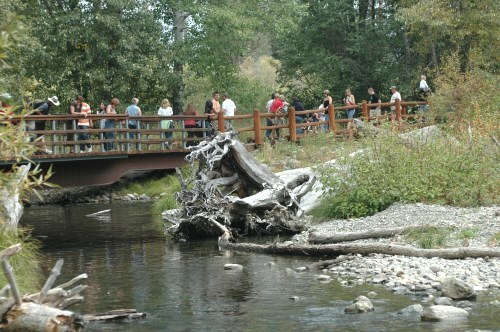 Visitors can walk the half mile loop Rainbow Trail through forests, meadows and marsh lands to the creek and see the Kokanee salmon up close (the trail is ADA accessible). A unique view is available in the underground Stream Profile Chamber located along the Rainbow Trail path. Coming from South Lake Tahoe, Taylor Creek Visitor Center is located about three miles north on the lake side of Highway 89 (known locally as Emerald Bay Road). The entrance is a right turn just past the entrance to the Tallac Historic Site. There is a free parking lot, but it fills up on busy weekends. This is especially true during the Fall Fish Festival because the Oktoberfest event at nearby Camp Richardson Resort is the same weekend. There is some free parking at Camp Richardson from which visitors can walk to Taylor Creek. There is also a bike path between the two locations. Runners can participage in the Kokanee Trail Runs, sponsored by the Mountain Milers on Sunday, October 7, 2018. A 1/2 marathon starts at 9 a.m. The Tadpole Trot starts at 10:30 a.m. and at 9 a.m., a 5k and 10k run will start. Day of registration is at the SnoPark, just past the bridge over Taylor Creek, starting at 7:00 a.m. You can register the day before at a yet to be determined location. Race courses are next to Fallen Leaf Lake, just a short distance from Taylor Creek Visitor Center.